It was a family event on Saturday to attend the 20th Annual Blueberry Festival in Nacogdoches, Texas. Founded on the El Camino Real (now state highway 21), one of a series of roads linking the Spanish colonies in the Americas, Nacogdoches' history is intertwined with the founding of the Republic of Texas. The town is now a delightfully quaint, tree-filled, college town (Stephen F. Austin State University), with brick streets and a thriving regentrified downtown. There are great coffee shops, tea rooms, and live jazz at the Hotel Fredonia each Friday evening, but on the second Saturday of June the focus is always on the blueberry. Streets are blocked off, booths pop up, live music blares, lines form before 8:00 AM for the fresh blueberry pancakes (here is the line when we arrived at 8:10 View this photo), and blueberry-themed entertainment is everywhere (View this photo, View this photo and View this photo). There are all sorts of family-friendly activities, free ice water supplied by local churches, and, of course, the Deja Blue Classic Car Show. Certain things you see only in East Texas. For example, the various downtown banks open to the public as venues for shows or activities--Cowboy Max (View this photo), Blueberry Cooking Shows, and the Blueberry Soda Shoppe. But, without a doubt, the most moving reminder that East Texas is not like other regions of the country, is illustrated by the photo at left. The gentleman pictured in the photo wandered among the crowd conducting interviews and asking attendees if they had a favorite song they would like to sing over the public address system. When the woman in the photo volunteered, took the microphone, and proceeded with a rousing rendition of "Jesus Loves Me", the gentleman immediately removed his hat and sang the entire song with her, after which he put his hat back on and the crowd responded with a loud ovation. I witnessed this and immediately recalled why I selected East Texas over Washington, D.C. to finish out my life. Some areas of the country seem to promote reading, reflection and contemplation--the Rocky Mountains and the Sonoran Desert, for example. Add to that list the Texas Hill Country. Rolling hills, limestone outcroppings, live oak and cedar everywhere, and wildflowers in abundance (the photo at left is a Texas bluebonnet spring meadow) make the hill country a beautiful setting. Quaint towns, great music venues, terrific food, numerous coffee shops and used bookstores all add to the region. I was in the hill country for several days over last weekend and it was a delightful time. My favorite stops included the legendary Luckenbach, Texas, birthplace of Texas Outlaw music (Willie Nelson, Waylon Jennings, Jerry Jeff Walker, and friends), for its 160th anniversary. Another favorite was Gruene ("Green") Hall, located in the quaint but discovered Gruene, Texas. The photo at right was shot in Gruene Hall on Sunday afternoon. Admittedly, neither Luckenbach nor Gruene are ideal for reading, reflection, or contemplation, but they are great music venues in a wonderful region of the country that does have sites that promote more sedate pursuits. The hill country is, by the way, in the heart of the burgeoning Texas wine country. It has a truly Texas "feel" and a history to match. I recommend the Texas Hill Country for a great travel destination, beginning in the state capitol of Austin and slowly moving through the hill country to end in historic San Antonio (View this photo)--the birthplace of the Republic of Texas (View this photo). Each year, roughly corresponding with the beginning of Advent, the Northeast Texas town of Jefferson, begins its celebration of the Christmas Season with the Candlelight Tour of Homes (for example, View this photo and View this photo). Claiming to be one of the oldest towns in Texas, Jefferson is filled with brick streets, antique shops, historic nineteenth century homes, an intensely serious historic society, and a Southern charm reminiscent of a time we can scarcely remember but deeply miss. The site of my favorite General Store in Texas, Jefferson is a delightful place to visit for any reason, but I most enjoy walking its streets, sitting on one of its many public benches, and reading and reflecting. I normally stay at the 1850s Excelsior House (View this photo), but the town is known for its many outstanding B&Bs. Not on its way to anywhere, if you visit Jefferson, you should not be in a hurry, and consider taking a boat ride on the Big Cypress Bayou or Caddo Lake. The whole area is a reader's and writer's paradise. 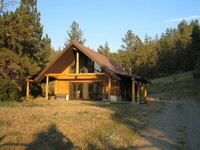 For those who have been visiting the Austin Hall Library blog for some time, you may recall that I returned last summer to a favorite Montana cabin for some reading and reflection. Here is the post mentioning the trip. If you weren't around then, you can follow the whole trip by reading each day's posts for a week or so after the initial post. The wonderful cabin that has been such a retreat for a number of years is pictured at left. Here it is now (View this photo)--the result of a much feared Montana lightning fire that swept rapidly over the hills. This is a last evening view of St. Peter's Basilica before returning to the United States from Rome. Our residence for ten days was seventy meters to the left of this picture, just outside the Vatican City walls. 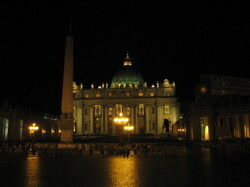 Here is a night view of the top of St. Peter's from our room (View this photo). And, here is a view of central Rome from the cupola on top of St. Peter's Basilica (View this photo), which was five-hundred, twenty challenging steps from ground level. Across the street from our residence was this building (View this photo), which houses the Missionaries of Charity, a religious order founded by Mother Teresa. 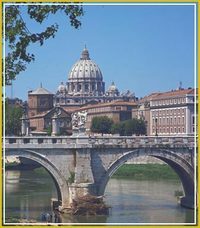 The deeply devout sisters care for the "poorest of the poor" in Rome and all over the world. Due to a heavy work schedule, I have recently been sporadic in posting to the blog. Hopefully, that will improve in the near future, but not the very near future. I leave in an hour for ten days in Rome, and, for several reasons, I will not be taking a computer. But, I will be taking a camera, notebook, and a hand-held tape recorder, in order to remember the sites and pictures. Scheduled to return late on October 10, I should be ready to post some updates by the next day. I am hopeful this trip will prove a strong motivation to get back on track with my reading schedule. Stay tuned. Here is one last view of the Billings International Airport, although when I left this morning it was still dark. Having enjoyed a relaxing and productive week in Montana, I returned home this afternoon to my latest order from Amazon. Among my mail was W.S. Merwin's translation of The Song of Roland, M.A. Casey's Meaningless: The Solution of Nietzsche, Freud, and Rorty, Terry J. Tekippe's What is Lonergan Up to in Insight: A Primer, and Four Texts on Socrates, translated by Thomas G. West and Grace Starry West. It was a good homecoming and I am looking forward to digging into the books. This is a picture (sketch) of me at work on a laptop in a Billings, Montana, coffee shop. It is remarkable how often travel has a tendency to increase reflection and even to increase production in writing. Gilbert Highet has an interesting section on the Middle Ages in his Introduction to The Classical Tradition, referenced here. He points out that much of the progress in the Middle Ages was educational progress; and "one of its chief marks was that the knowledge of classical thought, language, and literature expanded and deepened." Organizations were founded to study the classics and many of the great universities "appeared, like street-lights going on one-by-one after a blackout." But, what really caught my attention in Highet's Introduction was his statement that "scholarly activities were stimulated by correspondence and still more by travel." (emphasis added). Apparently, the men of the Middle Ages were serious travelers. There were knights,"wandering scholars," and folks who took frequent pilgrimages. According to Highet, there were far more people who traveled for education then than now. It was these travels, accompanied by philosophical discussion, debates, competitions, and correspondence that helped prepare the way for modern scholarship. The travelers all spoke Latin and usually nothing but Latin, thus, it became the international language of the Middle Ages. I may have heard or read all this before now, but it just seems more significant in the midst of travel. There is something about travel that calls for reading, reflection, correspondence, and written documentation. So, the next time I am in the midst of a reader's and/or writer's block, I will know that it is a sign that I should take a trip with a backpack full of books and a journal. 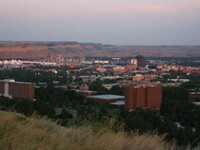 This is a twilight view of the City of Billings, Montana, from the Rimrocks I previously mentioned here. Years ago, I began my career in this city, and when facing complex problems I often retreated to this spot to reflect. Things just seemed clearer from here. 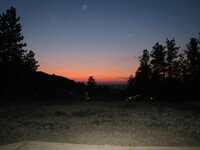 This (View this photo) is a view of the sun setting up the hill behind me. Life moves so quickly. It's as if you turn around one day and it is almost gone. Life moves in Montana like it moves elsewhere, but it doesn't seem to be in as big a rush, or as irritated about not getting where it is going before everything else. I have been so many beautiful places since I left here. I have spent time with important people, grown busier, worked longer hours, and slept less. I have ceased hiking, caught less fish--make that "no fish." I have not ridden a single horse, camped out a single night, or gone to a single outdoor concert. But, I am told that I am "successful" and that seems to help--until I get back to Montana. I have enjoyed the company of a couple of good friends the last few days. One, having completed law school and finishing the bar exam only days before, is literally bowled over by the Montana experience (View this photo). Actually, he is lying beside the Beartooth Highway trying to get a close up photo of a high mountain flower. Here is a better picture of him (View this photo) standing on the edge of a sheer cliff with the whole world behind him. This is the view from the cabin at sunset last night after a delightful trip to Red Lodge, Montana, and the Beartooth Mountains. We didn't get much in the way of reading done, but the scenery made up for it. Here is a view of a part of the Beartooths from the Beartooth Highway (View this photo), and here is a view of a glacial lake from the highway above (View this photo). This is a view of Rock Creek, which runs along the valley floor down to the Yellowstone River (View this photo). There is a picnic and camping area next to the creek where our family enjoyed picnics in years past. It is also a great creek for trout fishing. Red Lodge is now a bustling tourist town and gateway to the Beartooths. It is home to a Fourth of July Rodeo that is second to none in excitement and the town will host the Festival of the Nations beginning this weekend. The picture on the right is a view down the main street of Red Lodge at approximately 8:00 AM on a Wednesday morning. It was very busy on the way out of the mountains in the afternoon. Of special interest is the following picture (View this photo), which is a photo of a building that housed the bank where the Sundance Kid attempted a robbery in 1897, after escaping from jail in Belle Fourche, South Dakota. The great Sundance botched the robbery attempt and left town in a rush. The local Red Lodge sheriff commenced an eighty mile chase on horseback, which ended near Lavina, Montana, not far from Billings. The Sundance Kid was captured without a fight and promptly returned to jail in South Dakota, from which he again escaped. On the way up the Beartooth Highway, I ran into this fellow (View this photo). He was very friendly and almost ate out of our hands (View this photo).